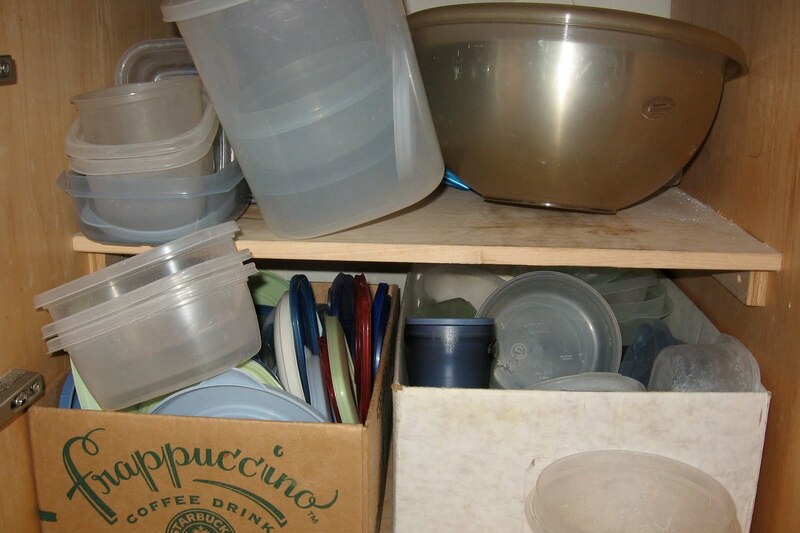 Does your “tupper” cupboard look like this? Don’t despair. Mine did too until just last weekend. I was tired of fighting the boxes, getting everything to fit, and trying to match the right lid to the right container. I don’t like to microwave food in plastic containers–and they are pretty gross with soap residue after going through the dishwasher. Ick. In a bold move, I dumped all the tuppers in the recycle and replaced them with glass containers. Now there are a bunch of spaghetti sauce jars and Pyrex dishes from Amazon (purchased with a gift card earned from Swagbucks, of course). Why the spaghetti sauce jars? We had been recycling them, and then I realized–leftovers don’t care what kind of a container they’re in [slaps forehead in disbelief]. Cooked pasta, slices of BBQ chicken, extra roasted veggies now go in jars instead of ziplocs or plastics. Yes, there are fewer containers. That will force us to eat up the leftovers more quickly, which keeps the fridge cleaner too. No more leftovers-turned-science projects for us! And check out how nice the cupboard looks. What do you keep your leftovers in? (Those of you with teenage boys in the house don’t have to answer, since you don’t have any leftovers.) Tell us in the comments. Love it! I am slowly replacing all my plastic storage-wear w/glass as well. I prefer it. Also, i save/reuse salsa jars, sauce jars, even small jars since you don’t always need big jars to store small amounts of items. Cheap, easy & much more eco-friendly (and better for us too)! Nice! 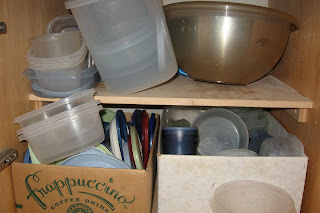 We still have lots of Tupperware & Rubbermaid in the cabinet, but we mostly use the Pyrex – we have the same set you do. Recently I have also moved my flours and sugar from large plastic containers to large glass jars with screw-on metal lids. Now I’m wondering what to do with the big plastic containers… sometimes I use those sorts of things to corral toys that have lots of small parts (like Littlest Pet Shop or Polly Pocket type stuff). Aha! But I have a way to FOIL this ingenious idea. Let’s just say — for example — a certain husband has a certain wife — OK? And this certain couple pack lunches for every day at work? Annnnnddd let’s just say this particular wife leaves her tupperware at work for three weeks at a time instead of bringing it home everyday like she should — and the majority of it just gets stolen by other co-workers. In a Hypothetical — non-real — way, of course. We have also been replacing plastic with glass. Some of the better “Tupper” pieces have made their way to my husbands garage (apparently, tools and hardware get along just fine with plastic). The BPA scare is what prompted us to do this but I do like glass much better aethetically too. I never thought about using glass jars for leftovers etc. That’s a great idea! Very great idea, I wil be doing the same. The jars reuse is great. I have done this for years now. I got a really good deal a few years ago on some canning jars marked down for clearance at our grocery store. I got several boxes in different sizes. I did not care for the 2 piece lids that came with the jars so I found the plastic lids. I did pay full price for them. (I looked it up, they cost $2.54 for 8 lids) I can also use plain old masking tape and a marker to date the jar of left overs. In years of using these jars I have not had a broken jar. Amazing to me. We also recycle some jars too. I often spray paint the lid (with left over paint) to make it pretty. I keep all my dry beans, rices, and pastas in jars. Fantastic. Good for you. 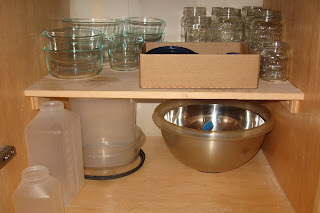 I use lots of glass jars and glass storage containers. I also use corn starch zip lock bags that I wash and reuse then compost them at the end do their life. I’m slowly get rid of all the plastic in our home too. I do have some plastic containers for my hubby to take to work and also so my little man doesn’t break the glass. 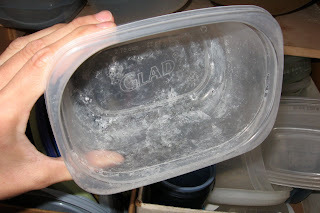 I have replaced my tupperware with glass but don’t like the lids they come with. I would like to come up with ideas for what to use instead of ziploc bags. I tried fabric ones and they seem to disappear. My daughter uses them for craft supplies. She said they were the perfect size. I bought a wonderful set of glass storage dishes from Costco a few years ago. They are great for re-heating and do not stain like plastic. I think they are still selling them, if anyone is interested. I did the same thing a little over a year ago – recycled all my plastic and invested in a lot of Pyrex. I also always have a bunch of Ball/Kerr jars on hand from canning. Ball now makes screw-on BPA-free lids for their jars, so you can more easily store stuff in them as well! I love glass! How do you pack lunches without plastic bags? I have both. I will have to think about whether I can let go of the plastic. I’m emotionally attached to my Tupperware. 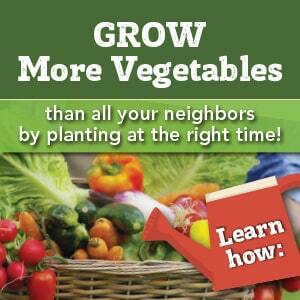 Amazing – I’ve been doing exactly this for the past month! Apart from all the sensible reasons for changing to glass, I like the look of my leftovers in glass. As for the packed lunches, I put my sandwiches in paper bags and use a pretty metal tin to carry them in. It used to have biscuits (cookies) in. You are so brave! I want to toss out all the plastic but I’m afraid. I’m so dependent! What about packing lunches? Will you send glass to school with kids? Hi! I actually found that I send better lunches to school now that we are plastic free :o) We have a stainless steel thermos for soup, leftovers, etc. I also have a few sets of Lunchskins (http://www.lunchskins.com/), which I love. They go through the dishwasher! 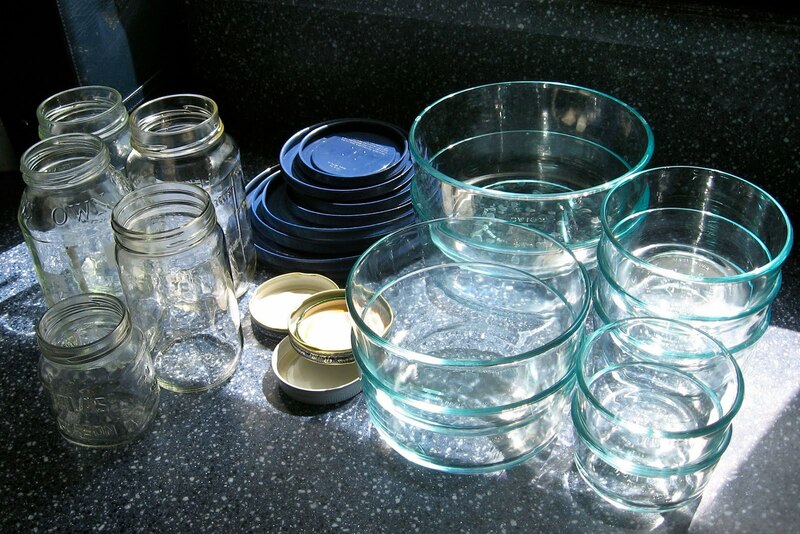 I’ve moved to glass as well gleaning some from thrift stores as well….and yes, I use spaghetti jars too. I’m clumsy. Until they invent glass storage containers that won’t break when I smack them into things, I stick to plastic. I don’t even trust myself to use glass glasses, I have a couple good BPA-free plastic refillable bottles I drink out of. Also, there are only two of us so I freeze a lot of leftovers and I’m paranoid about breaking glass in the freezer. Did I mention I’m clumsy? So it’s still plastic around here, but I have good quality stuff. I really want to do this. I only have a couple plastic containers because I threw away everything with bpa in it a year or so ago. It really is a great idea to switch to glass. I feel like we are really getting back to our roots of doing things the “old fashioned” way again 🙂 I recently started a Thursday link-up party (yes, today:), and I would really love to see this post and/or any others you would like to include. I am at allthingswithpurpose.com. Hope to see you there and for many more Thursday’s to come!! I love my Pyrex dishes!! I even found some that have glass and silicone tops instead of plastic. Thanks for sharing your progress over on Tuesday Greens! Woohoo! I just did this yesterday. I finally picked up two sets of Mason jars (16 oz and 32), and switched all of my plastics out. I recieved pyrex glass bowls for Christmas. So between those and canning jars I have just about made the switch over completely! I was just thinking this week that I need to switch away from plastic in the kitchen. I’m featuring this tomorrow on my Eco Kids Features post! If you take the whole thing you get less money because then they have to do the work (LABOR)…the way to get the most is to take apart and seperate metal..copper…some places take scrap metal..some dont…you can even start a bucket full of old eletric wire cords and strip them down for the copper if anything your using has a cord on it.. I still have some plastic for take to the party things but I have started keeping everything I buy in jars and . using them…plus mason jars are great. and mayonise lids fit mason jars btw. I have been trying not to buy anything that isn’t glass. I use a lot of it for my herbal concoctions etc.